In 2015, the mayor of Ventimiglia, Italy Enrico Ioculano signed l’ordinanza di divieto da dare da mangiare ai migranti— a municipal ban on serving food to refugees in the streets or those camped along the rocky beaches of the French-Italian seaside town. According to interviews and newspaper accounts, the mayor’s ban was a means of addressing food safety, waste and pest control concerns. Aid groups and activists, however, immediately resisted the ordinance, taking to the media, streets, kitchens and radio waves to protest what they see as the use of food as a weapon of exclusion. In France two years later, border activists Cedric Herrou and Pierre-Alain Mannoni faced fines, trial and charges for offering solidarities of food, shelter and safe passage. 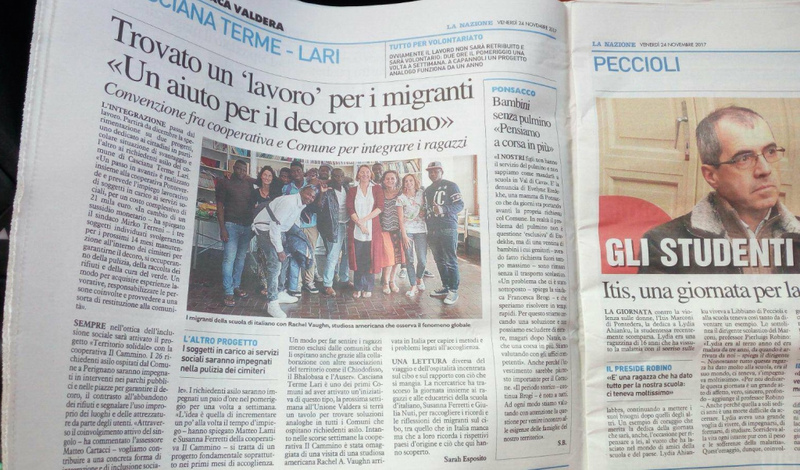 Legal scholar, human rights activist and director of l’Associazione Antigone Patrizio Gonnella spoke against the ordinance to Italian newspaper La Corriere della Sera, arguing that banning acts of human solidarity was inhumane. The ordinance certainly reflects concern over immigration and a perceived strain on municipal resources. However, since many contemporary asylum seekers to Italy come from African nations and the Middle East, some believe that the ordinance is a reflection of complex racialized and gendered tensions and stands in stark contrast to the humanism of other aid projects in the area. Thanks to a generous faculty summer research grant through the UCLA Center for the Study of Women, a new oral history project examines various roles of food and water in processes of asylum in Italy. Though I have been researching complex transnational tensions surrounding this particular municipal ban (and its May 2017 revocation) since Spring 2015, this unique research project formally began Summer 2017, when I conducted the first interviews and site visits. The call for participants is open and continuous, regardless of political affiliations, humanitarian aid or citizenship status. My broader interdisciplinary book project on the topic weaves together the interview data with legal, population, media and popular culture sources to analyze Italian asylum more extensively through the dual lens of the “edible” and the “necropolitical” —in other words, the politics of death, dying, the wasted or cast aside. I center my attention on the racialized and gendered political meaning-making happening through eating, by combining Kyla Wazana Tompkins’ conceptualization of “critical eating studies” with waste scholar Michelle Yates’ Marxist feminist Human-as-Waste and UCLA Gender Studies scholar Grace Hong’s work on necropolitics. By centering my research on edible tensions in Italy’s migration ‘crisis,’ I expand understanding of the raced, classed and gendered dynamics of border crossing within and beyond Italy, engaging the ways in which food and water serve as bio-political tools of inclusion and exclusion. Dr. Rachel Vaughn is Assistant Adjunct Professor in the UCLA Center for the Study of Women, Institute for Society & Genetics, and Gender Studies Department. She holds a PhD in American Studies from the University of Kansas. Her research engages the intersections of Critical Food and Discard Studies, Feminist Science & Technology and Environmental Studies. She is the author of “‘Choosing Wisely’: Paralleling Food Sovereignty and Reproductive Justice” (Frontiers); co-editor and organizer of “Edible Feminisms: On Discard, Waste & Metabolism,” a UCLA Luskin Endowment grant-funded conference and special issue of Food, Culture & Society. Vaughn’s forthcoming book is Talking Food, Talking Trash: Oral Histories of Food Precarity from the Margins of a Dumpster (University of Nebraska Press). She is author of a second manuscript-in-progress, Queer Toxic Soy & Estrogen Panic: Gendered Food Fear Mongering. She teaches interdisciplinary courses such as: Biotechnology & Society; Race, Class & Gender in Globalized Foodways; Sanitation & The Body; and Feminist & Queer Ecologies.